On Sale Now! 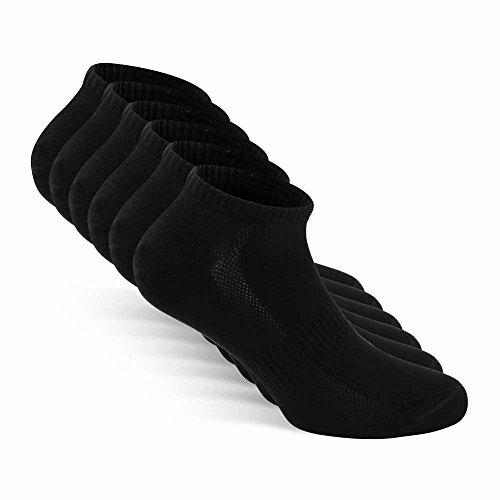 Save 7% on the Snocks Mens Socks Ankle Men Black Low Cut Men’s Cotton Athletic Size 9 10 11 12 by Snocks at Mas Fashion. Hurry! Limited time offer. Offer valid only while supplies last. NO MORE SWEATY FEET: No more worrying about sweaty feet all day: We added a new twist to sneaker socks as you know them: our socks come with a breathable strip that allows for better air circulation and will prevent sweaty or damp feet! BEST QUALITY: You deserve the best so don't be satisfied with average. Our black, white and grey cotton-rich ankle socks in sizes 3-5 will never shrink or pill - for maximum comfort and a long life, so you can enjoy them over and over again! They go great with every shoe due to their low cut style! THE RIGHT FIT: Say goodbye to tight and uncomfortable socks. Due to the elastane used, our ankle socks will fit your feet perfectly and won't ever itch! They are easily washable and are suitable for women and men alike. ANTI-HOLE-WARRANTY: Durability is our ambition: our ankle socks come with an anti-hole-warranty valid for 6 months. In case of a hole, contact us and get a new pair of SNOCKS right away!